Starhub – Irrational Debt Levels; Irrational Management? Bank loans made up 0.9 billion dollars in 2009! Let us take a closer look at the footnotes. Even in a world awash with cheap money, I found the interest rate that Starhub was borrowing at to be extremely low. In 2009, their floating rate loans bore i/r of only 1.24% to 2.13%. This already low interest rate was reduced further in 2009 to only 0.92% to 1.39%. In opinion, it makes perfect sense for Management to leverage on the historically low rates to fund their capital expenditures. Starhub is one of the few companies that use Free Cash Flow figures in their annual reports (a plus point for me) and for good reason. Even in the wake of the financial recession, they have posted impressive results. I do not foresee a problem with loan repayments at this current point of time. Starhub paid $20 Million in interest from bank loans last year (taken from the Cash Flow Statement of 2009’s Annual Report). Assuming that interest rates suddenly quadruple (highly unlikely in the near future but let’s take the worst case scenario here) to 5.6%, Starhub would have to fork out $80 Million in interest payments. A sizeable increase of $60 Million – but still within tolerable limits. I envision that as long as interest rates remain at their current levels, Starhub will have no qualms about maintaining the status quo. 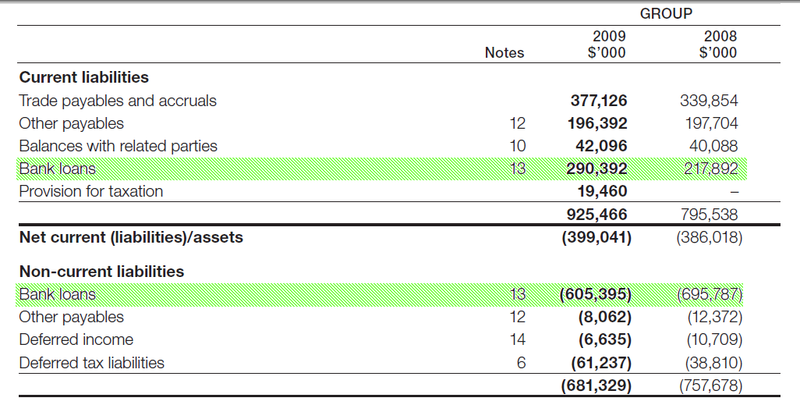 Cash Flow Statement from Starhub Third Quarter 2010. I want to bring your attention to another point – Refinancing. Judging from their cash flow statements, I suspect that Starhub is refinancing significant portions of their debt as the maturity date loans. This is akin to what REITs do when their debt is about to expire. In other words, they will be able to extend their loan maturity dates as long as they remain credit worthy. I came across a post in another blog stating that Starhub was not making enough in FCF to cover their monthly 5.0cents dividend payment. The more risk adverse among you (it could be just me though..) might be wondering why Starhub doesn’t reduce its dividend payment in order to give itself a greater buffer or margin of safety. The argument is that once a company has started paying a regular dividend (in this case Starhub has committed itself to 5.0cents a quarter), the market will expect it continue the cycle at regular intervals forever. Any disruption to this cycle will be perceived as a potential sign of financial difficulties and a loss of confidence. In my opinion, debt levels while significant, should not pose much problem for Starhub. Close monitoring of their financial performance in their years to come is in order however. I feel that management has delivered solid returns up till this point of time and I see no reason why they wont in the years to come. Starhub taking on even more debt despite a significant rise in interest rates. When faced with special situations such as these, its always good to dig deeper into the financial statements. Always make sure you understand the debt structure of the company. If its too complex, skip it. There are plenty of other companies that are much easier to understand. Disclaimer: The author is vested in Starhub. It would be absurd if Starhub actually borrows money to fund its dividends rather than its operations. In the case of Starhub, I believe it is doing so. The dividends paid and loans borrowed for that year is almost similar. So, it’s quite risky in my opinion to invest in Starhub just for its dividends. The issue that the credit crunch raised for highly leveraged companies was that looking to interest rates alone is an insufficient guide to how a company performs in the worst of times. Your bear case reflects a quadrupling of interest rates, but what would cause such a change? In the credit crunch (and the effects are still lingering today), companies found that they couldn’t get financing, regardless of the rate that they were offering. Although you point out the free cash flow, the danger here is that even your bearish case is under ‘normal’ conditions. You also need to satisfy yourself that, with profit margin and cash flow declining (Q3 2010 is the lowest for four quarters) and income statement costs and capital spending increasing (based on the Q3 2010 results), StarHub isn’t already meeting your rule #1. Also, if one looks at their revenues, mobile and fixed resedential aside Pay TV and Residential revenue are suffering and for mobile customers the acquisition cost is rising dramatically, therefore is all the debt-fuelled investment realising shareholder value? Also, I see that they aren’t publishing the profit numbers for these business units, which is really what you need to get behind. Thanks for your informative reply. I really enjoyed it. I doubt that i/r are likely to increase in the near future, with recovery being so delicate. I agree with your point that my FCF here is under “normal conditions”. I did actually consider this point. My view is that FCF is not going to be adversely affected by a downturn due to the nature of the service that Starhub offers (services offered are contractual in nature and its a necessity service). Thanks for pointing it out. The fact that cash flow was declining and profits/revenue were stagnating did come into my mind. The increase in capital expenditures is due in part to the increase spending in NextGEN. I think its great that Starhub is taking the lead here and the fact that it will be subsidized in part is fine by me. As for revenue/profits stagnating and cash flow declining, I am not too bothered. I still think its a great company to own. Its something defintely worth looking out for in the future. However, I can’t say I am losing any sleep over it. not sure if you know that there have been selling of starhub shares by insiders. (terry clontz if i am not wrong) when insiders sell their shares…you gotta be really careful. granted the dividend yield is quite high, but what if the stock price falls, the depreciation in stock price may not be able to cover the dividends gained.